Welcome to the Joy of ROX. I put this page together in order to share some of what I've done with the ROX desktop environment. 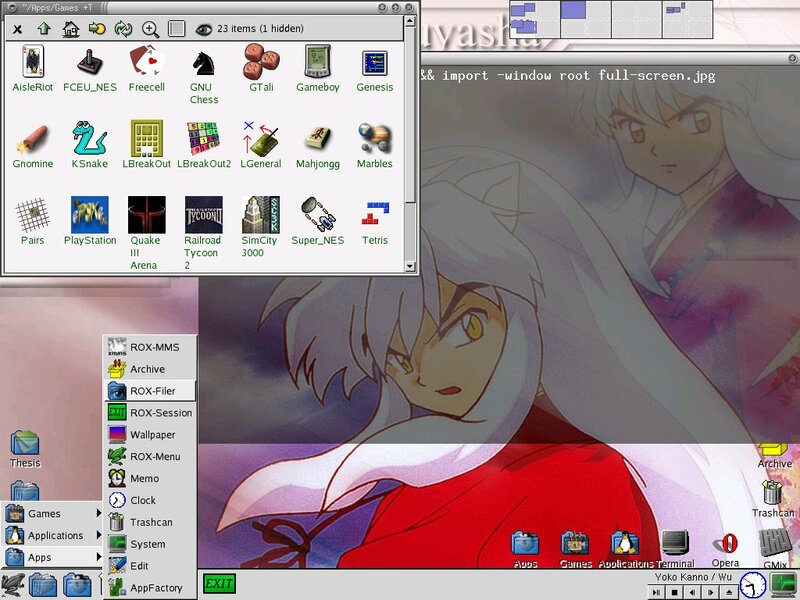 The ROX Desktop is an easy to use desktop environment based around the filesystem. It's main component is ROX-Filer, a light-weight GTK+ based file manager that also works well as a stand-alone application. Both the filer and the full desktop environment make very heavy use of drag-and-drop and application directories. On this site, I have posted some things that I hope will help others discover the Joy of ROX, including some applets, patches, AppDirs, papers, and scripts. 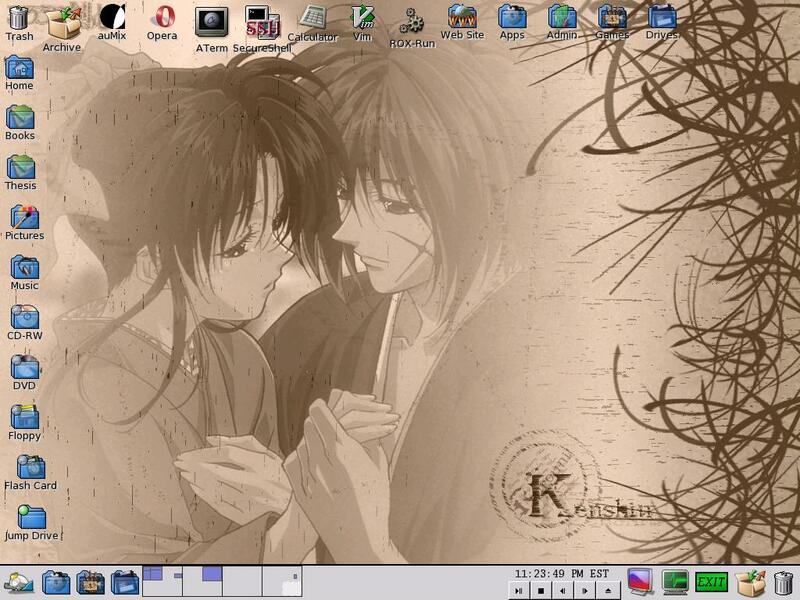 I have found them very useful in setting up my ROX desktop, and I hope you will as well. 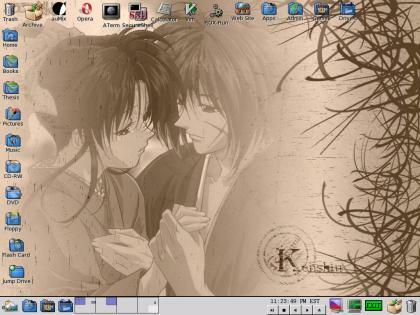 This is a shot of my last desktop. I've moved the Sawfish pager into the panel. The new version supports being used as a GTK+ plug, so I decided to take advantage of it and package it as a panel applet. Here's another newer screenshot, but with more going on. You may notice the popup menu in the upper part of the screen. That's ROX-Menu taking advantage of the new "no window" mode. Since the Sawfish menu is pretty dull (and a pain to configure), I thought I'd put ROX-Menu's newest feature to good use. I also set it up with a different configuration from the one in my panel, so I can have things like the the Sawfish configuration options. This one is slightly older. Of the 42 AppDirs visible on that screen, only seven are wrappers. 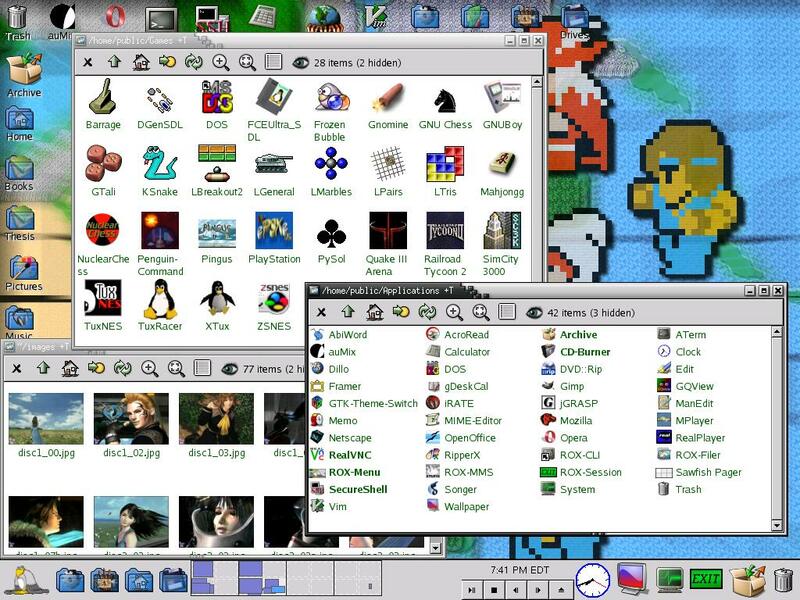 And of those, two are custom made wrappers that can start multiple programs and four are for programs that came with the standard Slackware 9.0 install. The other 35 are all either ROX applications or repackaged to be real AppDirs. In addition to these, I have a Games directory containing 28 AppDirs, of which five are wrappers and the other 23 are games that I've repackaged as real AppDirs. 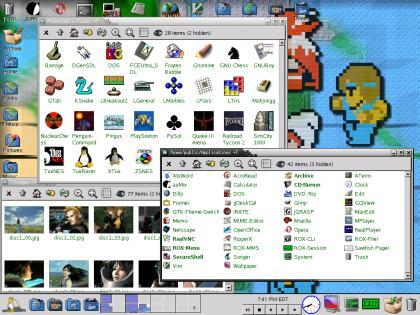 A screenshot of one of my older ROX desktops. I found that Sawfish worked better than any other window manager I had installed when running a full ROX desktop. The panel is about as small as I can make it, which I think works pretty well. 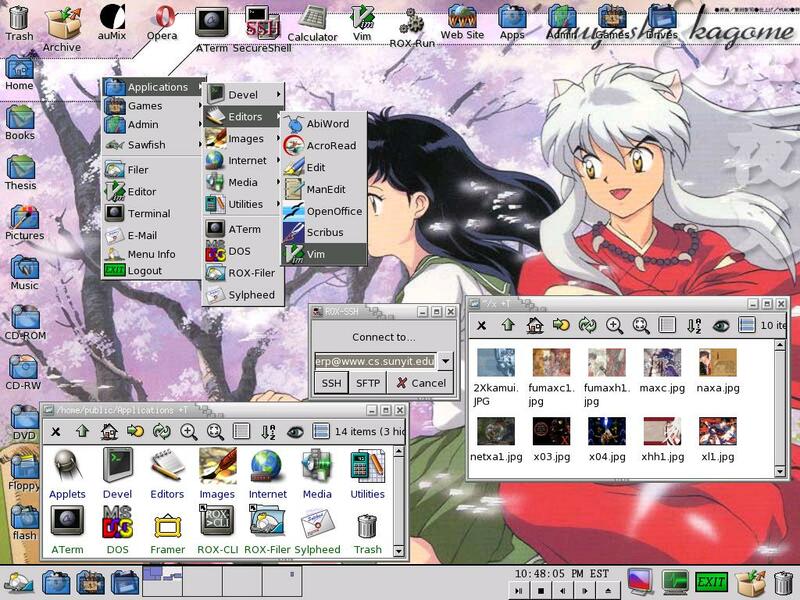 That's ROX-MMS on the right by the clock, a patched ROX-Menu with a smaller button icon on the left, and Inuyasha on the backdrop.